For each recorded session, you can view the location of the visitor, number of pages recorded, duration of the recording in seconds, device used by the visitor to access the website, browser used to access your website, and operating system of your visitor’s device. You can play, download, share, or delete any recordings captured in the reports page. 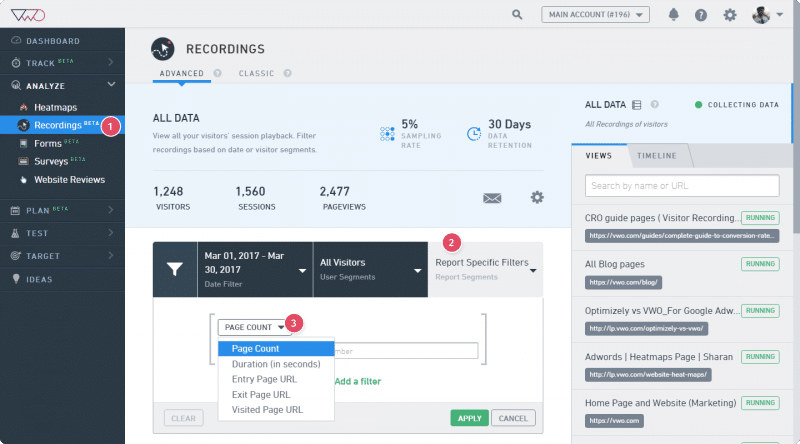 To filter your visitor recordings, Go to Analyze > Recordings. Under Report Specific Filters, select a filter you want to apply. 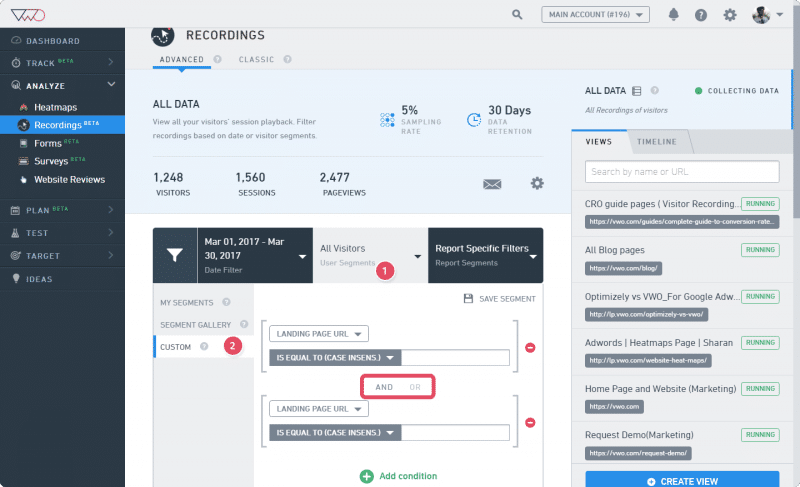 Using this option, you can also search visitor recordings by creating your own navigation funnel. ATTENTION Note that VWO will remove any trailing slash ‘/’ at the end of the URL you want to view. For example, https://example.com/t/top/6/ will be trimmed to https://example.com/t/top/6. You can create a filter based on any of the following parameters. You can also combine multiple filters and use the brackets  to combine multiple filters. Custom Tagging allows you to push tags and thus filter visitor recordings based on the tags you define. To use custom tagging, click All Visitors and then click Custom. When adding custom tags, VWO provides you options to negate a tag, such as “is not equal to,” and also use operators such as “and” and “or” for tagging. Using this option, you can select a visitor segment for which you want to record interactions. If you have enabled the segmentation option before starting a recording, you can access recordings for all the visitor segments you have selected. 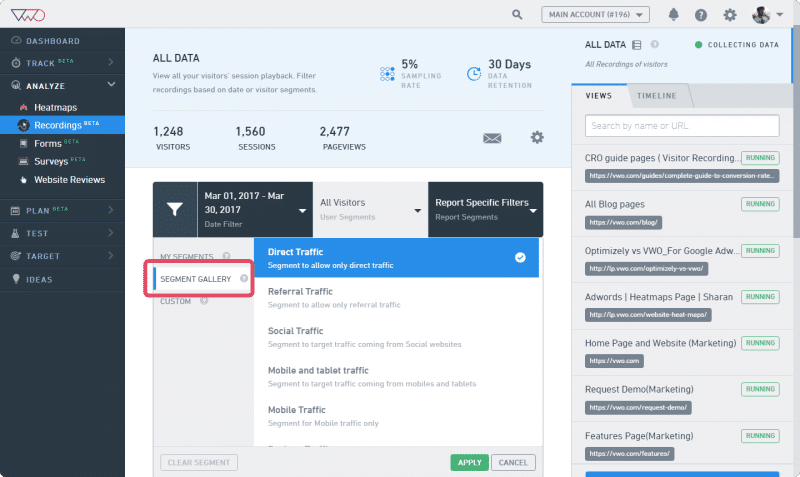 You can define segments based on the visitor traffic sources such operating system, device type, browser used, hour of the day, location, day of the week, query parameters, and so on. You can use an option from the default VWO lists or create your custom visitor segments. To learn how to create custom visitor segments, click here.